Curtis moved to Portsmouth from Derry City for £100,000 in May. 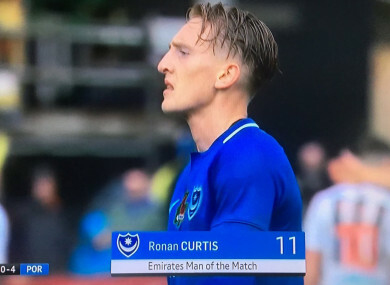 IRELAND UNDERAGE STRIKER Ronan Curtis made a real impression during his FA Cup debut on Saturday afternoon, with the forward picking up the man-of-the-match award during Portsmouth’s comprehensive 4-0 victory against Maidenhead United. Curtis, the godson of former Wales boss Chris Coleman, spent the first half of 2018 at Derry City in the League of Ireland, before securing a £100,000 move to Pompey back in May. The player has made an immediate impact at Fratton Park, scoring six goals and registering five assists in 15 League One appearances since making his debut back in August. His form also earned the player two international call-ups to Martin O’Neill’s senior squad, firstly for September’s friendly away to Poland and then for last month’s Uefa Nations League game at home to Wales in Dublin. On Saturday against Maidenhead Curtis did not get on the scoresheet, but ran the show in all other respects. The 22-year-old recorded two assists as goals from team-mates Ben Thompson, Oliver Hawkins, Jamal Lowe and David Wheeler secured their passage into the FA Cup second round. Curtis was born in London, but grew up in Donegal and has made eight appearances for Ireland’s U21s under Noel King. The striker was a stand-out performer for Derry in the SSE Airtricity League before earning his move to England, scoring five Premier Division goals this season. Curtis joined Derry City’s academy in 2014, making his debut a year later under Kenny Shiels in May 2015. The forward has earned repeated plaudits since moving to Fratton Park, with Curtis finding the back of the net six times in his first 10 appearances for Portsmouth. He was earlier this week named in Martin O’Neill’s provisional squad for this month’s games against Northern Ireland and Denmark alongside Shane Long, Michael Obafemi, Scott Hogan, Sean Maguire, Callum Robinson and Aiden O’Brien. Email “Promising Ireland U21 striker Curtis named man-of-the-match after FA Cup debut”. Feedback on “Promising Ireland U21 striker Curtis named man-of-the-match after FA Cup debut”.